Welcome back to the 'Study and Exam Skills' area of our 'Go The Distance' course. Each episode brings you a short, fun animation, full of advice, tips and tricks to help you become a better learner in all the key areas of your study life. This time we look at the skill of note taking. Do you want to be note perfect? Taking notes while listening is challenging. You have to concentrate on what you're listening to while you decide which bits you're going to write down - and how you should write them down. So how do you make sure you don't miss anything out? Watch the video to find out! 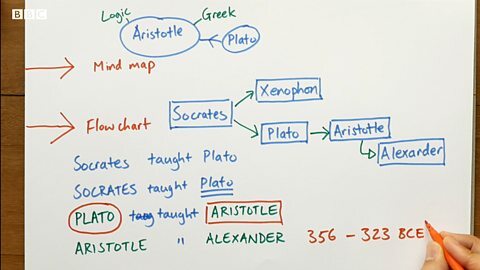 What are the best methods for making notes? Whoa there! Not easy is it? When you're listening and trying to make notes it can be difficult. The recording might be too fast, or you might not be able to hear every word clearly. Here's a tip – don't write down what you hear word. We've got lots more tips for you! Watch the video. See if you can pick up TEN top tips for making notes while you listen (write them down if you like). Then scroll down to check your answers. Welcome to our lesson. Please listen carefully and make notes. First one: before you listen. Don’t note everything down. And to save space, use abbreviations. And a quick and easy way to show relationships is to use symbols. Whoa there. Not easy, is it? Taking notes while listening is challenging. So, first off, here are three ways to help you listen more effectively. Number one. Don’t worry if you don’t get every word. Just try to focus on the main points. Number two. If you miss a bit, don’t keep thinking about it. You’ll miss even more if you do that. Number three. If it’s a video or audio file, pause and replay important or difficult bits. 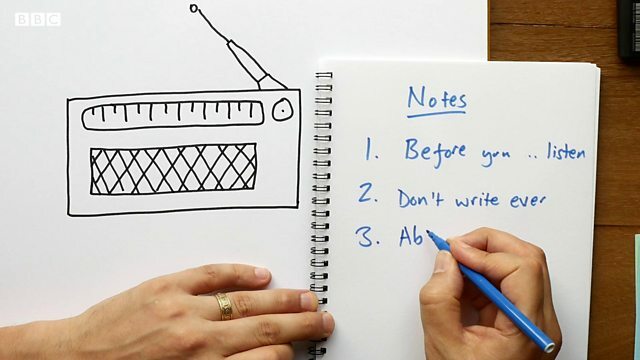 Now, ten top tips for taking better notes while listening. First one. Before you listen, gather information. Read relevant course materials. Anticipate what’s going to appear. You can research key words and phrases in advance, so you’re not surprised when you hear them. Another tip. Don’t note everything down. Take shortened notes. Think about what’s useful and what you can leave out. And a quick and clear way to show relationships is to use symbols. For example: ‘equal to’, ‘therefore’, and arrows. Lots of arrows! In fact, if you really love arrows, you might prefer a mind map or a flow chart to show how things connect. Or you might prefer to write simple lines of notes. But don’t forget, you can use capital letters, underlining, colours and shapes to help information stand out. Choose the style that works best for you. Phew! By now you’re probably taking a lot of notes. But this is important: leave some white space so you can add thoughts and clarify things later. Did you note everything down? Well done! You've nearly reached the end of this unit. At the bottom of this page you can find links to more useful study skills materials. But before we finish, let's review what we've learned about listening and taking notes. Check to see if you identified all ten tips! Prepare before you listen – gather information; read relevant course materials. You can research key words and phrases in advance so you're ready! Don't try to write down everything that you hear – decide what's really useful and what you can leave out. Use abbreviations to save space – things like UN for 'United Nations', AKA for 'Also Known As', and ASAP for 'As Soon As Possible'. Use symbols like = and + to show relationships – they're quick and clear. Mind maps, flowcharts, colours and capital letters can all be useful when taking notes – find the style that's right for you! Don't fill the page with words! Leave some white space so you can add to your notes later if you need to include more information or clarify things. Make sure your notes are clear: are you writing down a fact or opinion - and how do you know? Include sources so you can check things carefully. If there's a handout for the lecture, use it to help you organise your notes. When you've finished taking your notes, make sure you re-read them afterwards. This helps keep the information in your memory. Finish off by rewriting your notes – this is an even better way to make sure you remember things! So there we have it: ten top tips for taking notes. Click on the links below for more Go The Distance resources!